With lavish production values, one of the greatest ensemble casts in movie history, an exotic yet confined setting, and a convoluted murder mystery deep enough to capture and captivate all the attention, Agatha Christie's Murder On The Orient Express is a classic, old-fashioned, and timeless whodunnit. It's 1935, and five years after the high-profile kidnapping and murder of the young child Daisy Armstrong in Long Island, New York. The Orient Express heading west from Istanbul is unusually crowded. 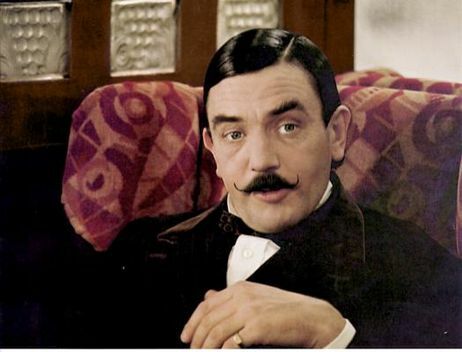 Detective Hercule Poirot (Albert Finney), on his way to London and a late addition to the passenger list, is soon getting to know his assorted traveling companions, who generally seem irritated that a detective is in their midst. The rich and ruthless American traveler Ratchett (Richard Widmark) offers Poirot a job as a bodyguard, after confiding that his life is in danger. Poirot turns him down, and soon enough Ratchett is dead, stabbed 12 times during the night, despite Poirot's presence in a nearby cabin. The train is stranded due to snow on a mountain pass in Yugoslavia, and Poirot has a limited time window to investigate the murder and identify the killer before the Yugoslav police arrive and apprehend everyone. Poirot soon discovers that the victim Ratchett was the evil mastermind behind the Armstrong case. 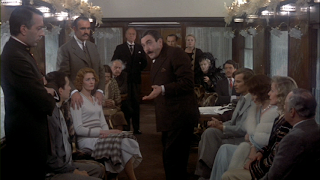 Poirot interrogates the passengers, finding plenty of revenge motives and opportunities, and a lot of lying going on. He needs to sort out the complex events during the night of the stabbing, uncover the killer, and determine whether the murder of a vicious murderer can ever be justifiable. With a long list of suspects conjured up by Christie's imagination and played by the likes of Lauren Bacall, Ingrid Bergman, Vanessa Redgrave, Sean Connery, Jacqueline Bisset, Michael York, Wendy Hiller, Anthony Perkins, and John Gielgud, director Sidney Lumet's greatest challenge is to quickly establish a persona for each, including a back-story, connection to the victim, and motive for the murder while allowing the stars to shine as they should in the limited screen time available for each. Thanks to a tight screenplay by Paul Dehn and performances that are only slightly exaggerated, Lumet succeeds brilliantly. Finney, hidden behind layers of make-up, is a memorable Poirot, and by necessity he does push the role to extremes of animation to establish his authority over both the luxurious setting and the assembled stars. Murder On The Orient Express is a mesmerizing journey, accompanied by a galaxy of stars and engineered by a master director.